NCR Paper is the modern day equivalent to the old fashioned and messy blue carbon copy paper. The acronym NCR stands for No Carbon Required. Essentially, it does exactly the same as the blue carbon copy paper allowing you to duplicate what you are writing, although it is the unique, invisible coating on the paper you are writing on that allows the copy to be made. The back of the first sheet of paper is coated with micro-encapsulated dye (known as a CB sheet – Coated Back). The bottom sheet is coated on the front surface with a clay that reacts with the dye from the top sheet (known as a CF sheet – Coated Front). Any additional sheets required in between are coated with clay on the front and dye on the back (known as a CFB Sheet – Coated Front & Back). When the top sheet is written on, the pressure from the pen (or impact from a dot-matrix printer) causes the micro-capsules to break and release their dye onto the clay coated side. As the capsules are so small, the resulting duplicate is an accurate copy of what has been written above. 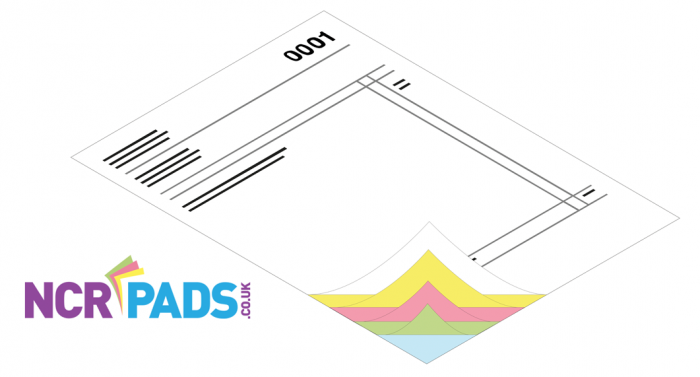 NCR Paper is available in various pastel colours; white/yellow/pink/green/blue and as long as the correct coated paper is used it can be collated in any order as required. Available in varying paper weights, the choice of paper is usually dictated by the printing press being used and the print run length. For example, long run jobs are more cost effectively produced on reel-fed printing presses (presses that use paper from a roll), these typically use 53/57/60/80gsm. Shorter runs are generally produced on sheet-fed printing presses (presses that use sheets of paper), which typically run 75gsm. Other weights of NCR paper are available, for example, on occasion when requested we may run a heavier bottom copy such as 170gsm, although this is now only available in white & chamois (creamy/yellow colour). We offer both reel-fed and sheet-fed NCR printing. To discuss your NCR project with us, please get in touch.